Cover Lamination— All of our cookbooks feature free front and back cover lamination. Lamination adds strength and durability to your cover, protects it from stains, and improves the overall appearance and quality by giving your cover a glossy finish. Foil Stamping— Foil Stamping option is available to add more value to your cookbook. This option is offered in two different colors: Gold and Silver. 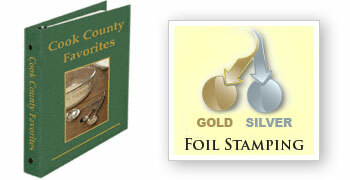 Gold or silver foil stamping enhances any cookbook cover, adding an elegance that cannot be matched with printing ink. Now available for our comb binders. *The foil stamping is only offered on front covers and 3-ring binding spines. Detailed photos or artwork cannot be stamped, only wording in a typestyle selected by Fundcraft graphic designers to insure that the type is easy to read and the proper size for the space available. There is an extra charge for the foil stamping as listed on the Price Chart Option chart, under "other features." Plastic comb binders can also be stamped, adding a touch of class to any cookbook. COVER-INKS— For an additional charge. these standard ink colors may be used for your imprint text on Fundcraft full-color cover designs or used instead of black to create a custom one-color cover. 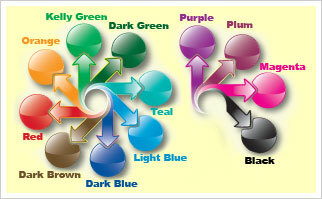 For non-standard ink colors, please provide a sample to match or specify a PMS color. Neons and metallics are not available. 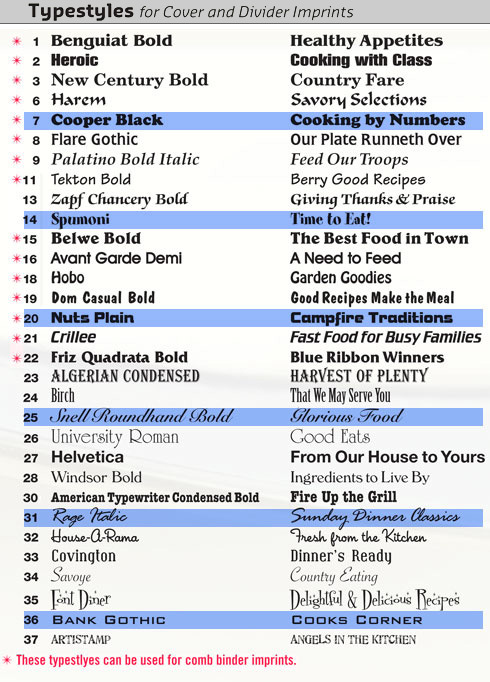 Cover Fonts— Shown below are the typestyles for use on your cookbook cover or black and white dividers. Note: Typestyles can only be printed as shown. Bold or italic cannot be added where it is not indicated on this list. If you prefer, our experienced graphic designers will select just the right typestyle for your book. For an additional charge, you may print on the inside of your book cover or on the outside back cover. A custom back cover which matches your front cover makes for a very polished looking cookbook. These are also great spots for premium merchant advertising. Note: Custom outside back printing is not available on Fundcraft designs in the three-ring binder style as the backs of these designs are pre-printed. Inside or outside back printing is not available for Ease.L.Back cookbooks. Clip art may be inserted into the spaces provided on Fundcraft C215, C356, C370, C985, C986, C987 or C988 or used to embellish a custom-designed cover. Several Fundcraft color cover designs (C985, C986, C987, C988) feature space to insert a black and white photo, sketch or logo. As an option, the photo may be upgraded to full color. Stock covers with full color additions will be charged as a custom full-color cover. Full-Color or black and white photo on back cover is FREE with an order of 500 or more books.For an additional charge, you can also elect to have a black and white or color photo on the inside front, inside back or outside back cover.